Vail’s Lindsey Vonn claimed her 8th win of the World Cup season on Sunday, winning a super-G in Cortina, Italy, and retaking the overall lead 900 points to 855 over fifth-place finisher Lara Gut of Switzerland. The win was the diamond anniversary 75th of Vonn’s career, leaving her just 11 behind the all-time ski-racing mark of 86 held by Sweden’s Ingemar Stenmark. 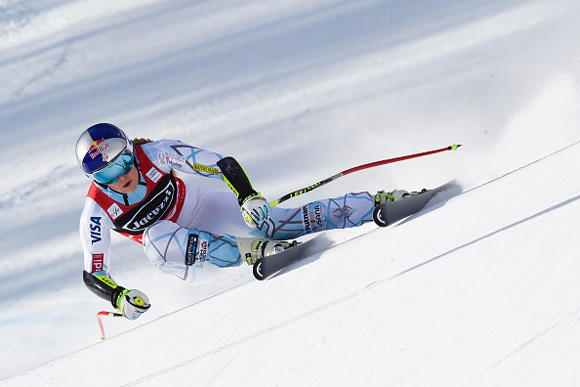 If she continues her torrid pace, Vonn may match her career best win total for a single season (12 wins in 2012). That season also marked the last time Vonn won the overall title — something she’s accomplished an American record four times (second only to Austria’s Annemarie Moser-Proell with six). CORTINA, Italy (Jan. 24, 2016) – Lindsey Vonn (Vail, CO) notched another Audi FIS Ski World Cup victory, number 75, Sunday in super G and moved into the overall World Cup lead. Vonn took victory No. 75 in commanding fashion by 0.69 over Tina Weirather of Liechtenstein. Germany’s Viktoria Rebensburg was third. Lara Gut of Switzerland held the overall World Cup lead by 10 points over Vonn coming into Sunday’s super G, but finished fifth Sunday and surrendered the lead to Vonn by 45 points in what has become a back and forth battle for the overall. Five Americans finished in the World Cup points Sunday. Stacey Cook (Mammoth, CA) was eighth, Laurenne Ross (Bend, OR) 14th, Alice McKennis (Glenwood Springs, CO) 28th and Anna Marno (Steamboat Springs, CO) scored her first World Cup points, finishing 30th. Abby Ghent (Edwards, CO) was 36th. Vonn won for the 11th time at Cortina, sweeping both the downhill and super G at the Italian resort for the third time in her career. Swiss ski team coach Roland Platzer set a tight, technical course for the women on Sunday; one that many felt didn’t favor Vonn’s skiing style. But she proved them wrong. Up next, the women head to Maribor, Slovenia for giant slalom and slalom events Jan. 30-31. Then off to Garmisch, Germany for downhill and super G races Feb. 6-7.